Someone who could communicate that is senior running back Isaiah Saunders. The 5-foot-10, 230-pound senior was Idaho’s second-leading rusher a year ago, a runner whose pads are always low and squared up against defenders as surely as a compass points north. Idaho coach Paul Petrino said the strength of Fresno State’s defense is its linebackers, including all-Mountain West first-teamer Jeff Allison, George Helmuth (honorable mention) and James Bailey. 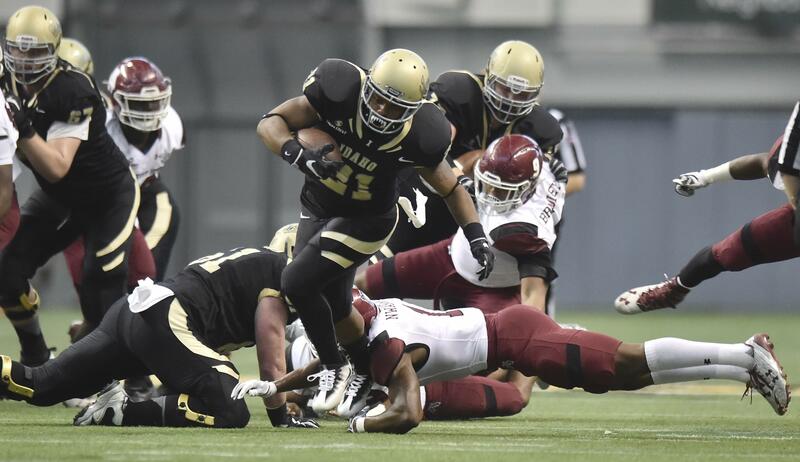 But Saunders dealt with strong, mobile linebackers for the past two years when Idaho played in the Sun Belt Conference. Saunders doesn’t expect to see anything from them he can’t handle. Saunders, senior slot receiver David Ungerer and junior quarterback Mason Petrino have been reinforcing a message this week to young teammates who are going to run onto a field for real for the first time Saturday. “Trust everything you’ve been doing through spring ball and fall camp,” Saunders said. His words have the ring of truth, because not only does Saunders look like someone’s dad on the field, he is a father. He and his fiancée, Brianna Smathers, have a 3-month-old son, Ezekiel. Where other seniors are focused on finishing strongly, graduating and enjoying their last year in college, Saunders is juggling a class schedule and football while probing the mysteries of a newborn. Maybe because of his solid build and beard, Saunders projects an image of maturity in practice. In a break between a drill with the quarterbacks and receivers, he wandered over to the edge of the offensive line group, watching while the linemen came out of a stance and set up to pass-block. Saunders’ uniform reinforces the image. The black No. 21 on the front of his white practice jersey has almost faded away. The garment looks like a hand-me-down from his father, Walt, who played at Idaho in the early 1990s. The jersey, over a shoulder pad, is frayed, a testament to Saunders’ eagerness to attack defenders. Early-morning feedings haven’t robbed him of any energy in practice, either. The Vandals have run many counters this preseason. Day after day, starting one way and cutting back, Saunders works his way through interior line gaps with quick, cat-like feet. He bursts past linebackers and runs out plays to the end zone. He catches swing passes out of the backfield, pass-blocks and spins out of tackles. “That’s just instinct, honestly,” Saunders said. He is looking for a 100-yard game Saturday and a Vandals season-opening win. He is playing this year with a positive perspective. Last season, he watched a teammate, all-Sun Belt linebacker Tony Lashley, who his playing a final year as a graduate transfer at Boise State, manage football, school and a family life with a wife and four children. Published: Aug. 30, 2018, 6:15 p.m. Updated: Aug. 30, 2018, 6:50 p.m.